It’s been a while since I’ve been able to get so caught up in reading, so involved into a story and its’ characters that I finished a book in two days. But Poison Study did that for me and I love it for that! I now understand why this is one of the must-read fantasy books. EVERYTHING about this book spoke to me and renewed my passion for YA fantasy. Let’s summarize! A strong and relatable main character. I was pretty quickly very fond of Yelena. She’s been through a lot and is about to be executed for murder when she is given a chance to become the Commander’s food taster. A job that is extremely hard and dangerous in itself, and on top of that she still has to deal with other people wanting her dead. This situation would leave many people scared and losing hope, but Yelena is a fighter. She’s not all that special, but she’s brave and smart and she WORKS for everything. Everything we learn about her, we learn because we see her acting. We’re never told about her personality, we see it in unfold from beginning until end and it makes me in awe of her. Dark and mysterious love interest. Now, this can be hit or miss. It can be done very badly or it can be done extremely well. For me, the character of Valek definitely falls under the ‘extremely well’ category. I was super intrigued by him and couldn’t read fast enough to try and figure him out. He’s more than just your standard ‘dark, mysterious and brooding’ guy and I loved his interactions with Yelena and was so on board with their budding romance! Secondary characters! I’m a sucker for friendships and the friendship between Yelena and Ari and Janco had me gushing. It developed just right, but I just wish we had more of them. More in the next few books please? Overall, this book made me feel pretty similar to Throne of Glass. (Poison Study has been around way longer though). Both books have very similar plot points and I had the same feelings while reading both series, though I must say I feel like Poison Study did everything just a tad better. Better characterisation, better romance, better pacing, better mystery. Other than the ending, I found everything about it highly enjoyable and I’m definitely curious to read more! “Yelena.” I halted in the doorway, looking back over my shoulder. Have you read Poison Study? What did you think about it? I hadn’t heard of this book but it sounds wonderful. I love books that feature friendships so the bond between Yelena, Ari, and Janco sounds especially appealing to me. Adding this one to my TBR. Great review! 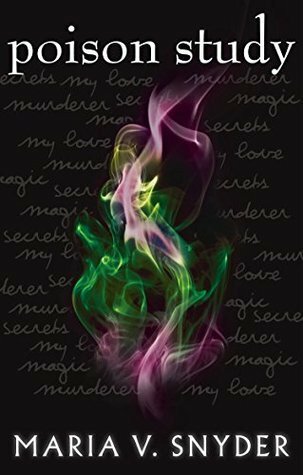 Suzanne @ The Bookish Libra recently posted…Cinderella, Necromancer Blog Tour: Exclusive Excerpt & Giveaway! o0o I need a book that will renew my love for YA fantasy right now. YA Fantasy is my go-to but recently I haven’t read anything that I’ve loved. I’ll have to check this one out! Oh, I was in a similar situation, but this book did the trick for me in renewing my love for YA fantasy so I hope it’ll do the same for you! I need to continue the Throne of Glass. I’m glad you enjoyed this one. I really enjoyed the whole Poison Study series. I’ve wanted to read this book for I don’t know how long but you just made me convinced that I definitely need to read it soon. Sounds so awesome!! Happy to hear I convinced you to read it soon 😉 Hope you’ll love it as much as I did! Yes!! I <3 adore Maria V. Snyder! Keep reading on, though I think that The Poison Studies was the strongest in the series. Completely agree with your review! I am so interested in this one! I think I saw it with another cover on someone else’s blog. Awesome review! Oh, and I loved ALL the quotes you used!